Take one bite of these Dulce de Leche Shortbread Bars and your life will be complete! Once the cooler temperatures arrive, I’m in the kitchen at home for longer and longer amounts of time. Baking and cooking, but mostly baking. Maybe the oven warms me up even more, but really it’s the results I get when I bake, like these Dulce de Leche Shortbread Bars from the new Quick Shop & Prep 5 Ingredient Baking cookbook by my friend Jennifer McHenry. 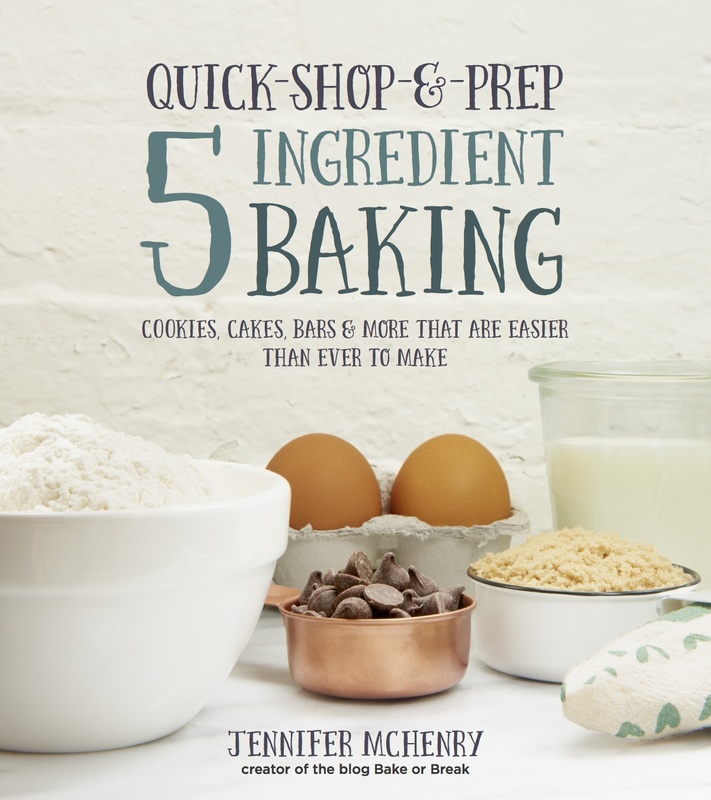 Jennifer blogs over at Bake or Break and has created a book that you’ll love throughout the holidays and the entire year! She teaches you how to prepare the perfect pantry to get ready to make with just a few key ingredients – I urge you to make these Dulce de Leche Shortbread Bars as soon as possible! Quick tip: I didn’t follow instructions all the way and let these sit overnight instead of two hours. The chocolate gets very had if you do, so follow the instructions Jennifer writes and you’ll be just fine! These are incredibly simple to make and taste like you spent all day on them – perfect for the holidays! "Just start by baking a simple shortbread crust, top that with rich dulce de leche and chocolate, and you’re done. With a short baking time and a couple of quick refrigerator stints, you’ll love how quickly and easily these bars come together." Preheat the oven to 350°F (180°C). Grease a 9 x 13 x 2-inch (23 x 33 x 5-cm) baking pan. Line the pan with parchment paper so that about 2 inches (5 cm) of paper hangs over the short ends of the pan. Using an electric mixer on medium speed, beat the butter, brown sugar and vanilla until thoroughly combined. Reduce the mixer speed to low. Gradually add the flour and salt, mixing just until combined. Press the mixture firmly and evenly into the prepared pan. Bake for 20 to 25 minutes, or until the crust is golden brown. Set the pan on a wire rack, and allow the crust to cool to room temperature. Spread the dulce de leche evenly over the cooled crust. Refrigerate for 20 minutes, or until set. Place the chocolate in a microwave-safe bowl. Heat in a microwave at 50% power in 30-second increments until the chocolate melts when stirred. Stir until smooth. Allow to cool for 5 minutes. Then spread the melted chocolate evenly on top of the dulce de leche layer. Refrigerate for 20 minutes, or until set. Use the overhanging parchment paper to lift the bars out of the pan and onto a cutting board. Use a sharp knife to cut into the bars. Thank you so much for sharing a recipe from my book, Marnely! I’m so glad you liked them. They were an instant favorite around here!